An Introduction to Health and Safety Law provides a clear, concise overview of health and safety law in the United Kingdom. With reference to the European Union, this book discusses criminal and civil liability at length to provide a clear understanding of this area of law which has been subject to change over the 20 years. Key case studies and statistical information on prosecutions, fines and enforcement notices help to contextualise health and safety law to provide students and professionals with a full understanding of health and safety law in the UK. This book is an essential reference for students studying towards NEBOSH qualifications and students studying at university level. 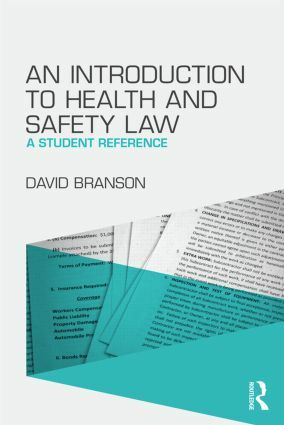 It provides a comprehensive understanding of UK health and safety law and will be a useful reference when entering the professional field. David Branson, LLB (University of London, UK), Barrister (Middle Temple,UK), Master in Jurisprudence (University of Durham, UK), has a postgraduate diploma in occupational health and safety (Aston University, UK). He is Course Coordinator for the health and safety courses at Middlesbrough College, UK, delivering on the NEBOSH certificate and diploma courses. He has written a number of articles on health and safety law, published in Safety and Health Practitioner and the New Law Journal.